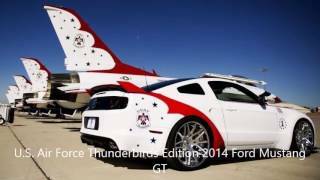 Ford has unveiled their one-off Mustang GT Thunderbirds Edition to celebrate the 60th anniversary of the U.S. Air Force Thunderbirds. The Thunderbirds Edition will be sold at the Experimental Aircraft Association (EAA) AirVenture show in Oshkosh, Wisconsin on August 1st. 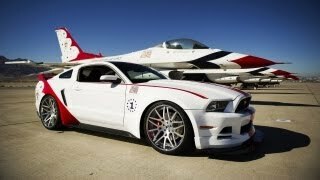 The Mustang GT Thunderbirds Edition has custom brilliant white paint with red and blue accents, as well as markings and logos, tying it to the Thunderbirds’ F-16 Falcon aircraft. 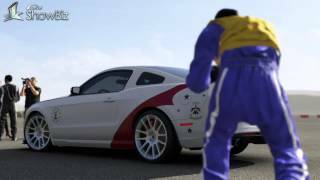 The Mustang has a wide body kit, a glass roof, Forgiato created custom 22-inch wheels and a painted “belly pan” that emulates the F-16 Thunderbird appearance. On the interior the Thunderbirds Edition gets a modified navigation screen, instrument cluster, rear seat-delete and seats with embroidered Thunderbirds elements. Additional features include unique sill plates and puddle lamps that project the aircraft silhouette when the doors open. With the addition of a Ford Racing supercharger, suspension handling pack and Brembo brakes, the U.S. Air Force Thunderbirds Edition Mustang will exude class, power and performance. All proceeds from the car donation and sale will benefit the EAA Young Eagles program, which helps to inspire and motivate the next generation of leaders, aviators and innovators.